Get-Paid Review – Scam or Legit? Get-Paid is a GPT(Get paid to) site which is online since 2006. Get-paid is a GPT( Get paid to) site in which you can earn money by pay per click, completing offers, taking the surveys, watching videos. To earn money in Get-Paid, you need to collect coins. You can collect coins in different ways such as completing the tasks, offers, watching videos and making referrals. You can redeem those coins for cash or prizes. You can also win coins in Get-paid. To win coins, you need only to do the same as you earn coins. You can win coins by taking part in the contest and in sweepstakes. This contest runs every month. The user who earned most coins wins a prize. The top user will be win 25000 coins that are $50 worth.To win the contest, you need to complete as many as offers, surveys, videos. The more coins you earn more your chances to win the contest. Referrals, games and bonus earning will not be the part of the contest.There is an offer wall like Super rewards, Matomy, token ads, supersonic, payment wall by which you can collect coins. The minimum payout is $0.50 for most members but the members from the countries USA, UK, Canada, Australian the minimum payout is $1. For cashout, you can use the payment processor like Paypal, PayzaPerfect Money, Web Money and Bitcoin. Cashout will take 24 to 72 hours. In Get-paid, there are XPs. XPs are the experience points, the more XPs you collect, your level also go up by which you earn more coins. Levels are how you advance in this site, whenever your level will be up your earning will also grow. As you level up, you can access locked features in Get paid.To collect XPS, You need to use the site as much as you can earn by doing the completing task, watching videos, taking surveys. You will get a lot of XPs when you refer others. You can earn good money by making referrals in Get-Paid. In Get-paid, there is 2 level referrals system. First level referrals are the members which are referred by you and the second level have the members which are referred by your referrals. You can earn up to 30 % from your direct referrals and up to 20% from their referrals. If you do not know how to make referrals, then Click here to know the program which tell you how to do that and help to make a good online income for you. It is trusted and legit GPT site which is paying online more than 9 years. Get-paid is free to join. The minimum payout is $0.50. In Get-paid, USA, UK and Canada members get more offers in compare of others countries. But Get-Paid provides worldwide service so you will also get good offers. You will find some offers, they will require your credit card details to complete the offers so we recommended you to not to do those offers. Get- paid is a legit site which is paying on time from more than 9 years for their members. It is a good opportunity t0 earn good income with this site by completing the survey, offers and referring others. If you want to ask anything about Get-Paid, Please ask in the comments area below. We will reply you shortly. Clixsense Review – Scam or Legit ? Neobux Review – Scam or Legit? 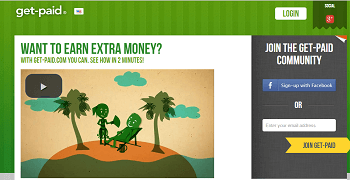 Buxvertise review – Scam or Legit? GPTPlanet Review – Scam or Legit? © 2019 Online Income Resources. All rights reserved.